Today I see that there is no wrong way to live or to learn. That was a time of deep discovery and communion. It was divine, but more importantly, it was just what I needed. Right now, I need something different. Tomorrow, who knows? The astrology this week is a bit of a game of catch between many different players. The planets are willing to work as a team, but that doesn’t mean nobody gets hurt. 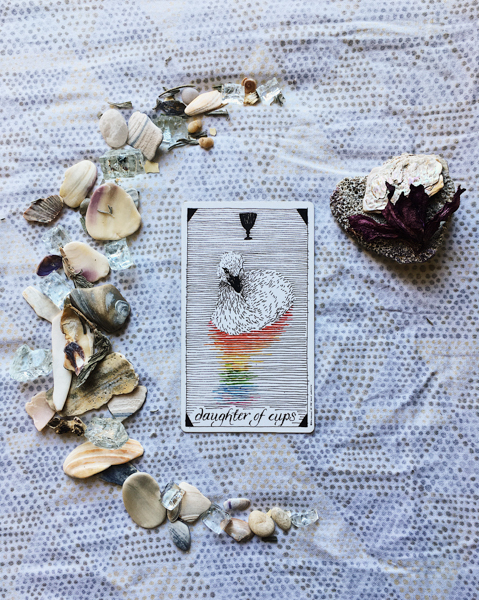 The Daughter of Cups asks us to couple up with our individual needs and to be a student of the feelings that wash through us. She coaxes us to look in the mirror, greeting anger and joy, grief and inspiration. She prompts us to receive our emotions with undemanding curiosity. I see the Fool and the World in every daughter/page because they represent a willingness to enroll in the education of experience. They beg respect through their inherent innocence and marriage to enthusiasm. This week, take comfort in the understanding that awakening each piece of yourself is a process of transformation. Accept solace in the changing colors of your evolution. Hold company with time so your light can reflect and your shadows may stretch as you rub their weary eyes into consciousness.